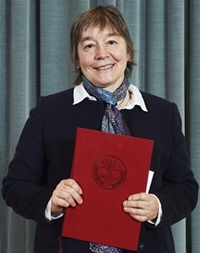 The 2016 Hans Sigrist Prize is awarded to Gabriele C. Hegerl of the University of Edinburgh for her groundbreaking scientific work in this year’s prize field, “The Human Fingerprint on the Earth System”. Prof. Hegerl has brought about continuing innovative scientific contributions that enabled the detection and attribution of anthropogenic climate change and her work has helped to clarify the causes of global climate change and, thus, enabled significant progress in international climate policy. She has also demonstrated longstanding dedicated leadership on the Intergovernmental Panel on Climate Change (IPCC), where she has assumed societal responsibility, and has shown inspiring enthusiasm in working with young scientists. HSF: How did you get interested in your field originally? Hegerl: I originally studied mathematics, and I really enjoyed it. After finishing my Ph.D., I was looking for what to do next, and everyone else in my class went on to “serious jobs” in consulting, which seemed like the natural path. However, I saw that the Max Planck Institute in Hamburg did climate simulations. I was a mountain enthusiast, and I went skiing, hiking, and mountain climbing with my friends, and I had learned about glacier retreat from the older maps we got from the Alpine Club, which indicated that the glaciers were further down than they actually were. We were all concerned about environmental issues at the time, and I was concerned about the glacier retreat. I thought the job at Max Planck would be really interesting, so I just applied for fun, while I was also applying for “serious jobs” (laughs). I persuaded myself that it would be a good thing to do for just two years as an experience, because when I went up there and visited, it was such an exciting environment, people were travelling all over the world, and they were collaborating internationally, and it was a really interesting subject that I thought was important. I stumbled into one of their best topics, which was the fingerprint of climate change, specifically trying to detect if climate change was actually happening through data, so that was the beginning of my career in this field. HSF: Could you explain your current main area of research to people who are not experts in climate change? Hegerl: My research is largely about understanding the fluctuations in observed data for climate, so trying to understand if those are realizations of variability – of just the normal dynamics in the system – or if they are in response to changes in external influences, like changes in greenhouse gases or volcanic eruptions. We use so-called fingerprints of external drivers, which usually arise from models and quantify what change we expect to occur due to external forcings. Then tests are applied to determine if there is evidence for these fingerprints in observations. For example, the temperature response to greenhouse gases is expected to warm land more than ocean and ramp up over the historical periods. Volcanic eruptions are expected to lead to short-term cooling. This is because both change the energy budget of the planet, which is reflected in temperature, and the time at which this occurs depends on the thermal inertia of the system. It gets more complex when looking at precipitation changes. Greenhouse gas increases warm globally, which means the atmosphere becomes moister but the pattern is not expected to be a general increase in rainfall, but a moistening of the wet regions. Extreme rainfall also is expected to become strong in many regions. HSF: Are you focusing on any certain geographic regions, or is it worldwide? Hegerl: My reseach is very much worldwide, because the more data you use, the easier it is to disentangle the causes of climate change. For example, greenhouse gas increases change the energy balance of the planet, and therefore, should cause worldwide global scale warming, so the more data you look at, the stronger the evidence for or against it gets. When you look for changes in rainfall patterns, which is something I have found interesting in the last few years, there is a global pattern with strong regional variations. Warming due to increasing greenhouse gases means that worldwide mean precipitation increases, as a warmer atmosphere can contain more water vapor. However, the water transport in the atmosphere changes when greenhouse gases increase. Because of that, we expect to see, in our fingerprints, a very distinct pattern of wet getting wetter and dry getting drier. So, we have to look at regional changes in wet and dry regions. But only when we account for how the wet and dry regions move with the seasons and with variability, we see evidence that the contrast between wet and dry regions is indeed strengthening in satellite observations, that means my research does focus on regional variations, but the regions are chosen based on the pattern of change we expect to see from human influences. Volcanic eruptions, by the way, cause a similar change, just the other way around: wet gets drier and dry gets wetter. HSF: How much are greenhouse gases affecting our weather? greenhouse gases affect weather – when an unusual heat wave, flood, or drought arises, it is natural to ask if these events are linked to climate change. There is worldwide activity testing if a connection exists – for example, there is a very nice paper from a colleague on the Russian heat wave, which shows that the Russian heat wave was a very strong temperature anomaly, and most of the discrepancy between the temperature of that heat wave period to normal summer temperatures was just due to unusual weather, just the kind of weather that causes heat waves. However, because of greenhouse warming, the event got a little bit warmer than it would have otherwise been. If you look at it from a different perspective, at how rare an event the heat wave is, then you realize that temperatures as high as observed would have been expected to occur much more rarely without climate change. So, if we look at the frequency of extremes, we see quite a strong change due to human influences. My own interest is particularly in events in the historical past, such as the 1930s heatwaves that set long-term records in the United States – what made these events so extreme, and what does this teach us about possible future heat waves? And why do some decades show a fairly high occurrence of heat waves and other decades do not show much at all? HSF: What do you personally think that the biggest challenges are in your research field, in terms of areas that still need to be conquered? Hegerl: An area which I am really excited about is analyzing the data that are now becoming available for climates of the past. I have worked with indirect records such as records based on tree rings and historical documents, such as diaries. The University of Bern is very strong in that area. Now, there is a big movement to digitize more old data, such as log books, so people can analyze them. This can tell us about weather, storms, temperatures, and sea ice in the past, and we can learn more about the climate of the last 200 or 300 years - I think there are going to be very interesting insights coming from that. My own research right now looks at what caused the warming in the early part of the 20th century, how big the climate fluctuations in the 19th and early 20th century were, and what caused them, and to what extent the effects of greenhouse gases were already visible by the early 20th century – after all industrialization started in the 18th century. People are also running climate models back to that time to see if with our present models, we can understand the fluctuations in that time period. This is something about which I am quite excited. HSF: So, you already see humans having a tangible fingerprint that long ago? Hegerl: There was a transitional point – the Little Ice Age, which extends from the middle of the last millennium to about the early 19th century, was a period where particularly winters were much colder than today, for example, in Europe. My research in the past has focused on explaining that fluctuation: there was overall strong volcanic activity, so that depressed mean temperatures a little and made cold summers and winters more likely. There was also somewhat reduced solar radiation, which my research suggests was not as important as the volcanoes, and there was also a little drop in carbon dioxide, not much, but a sustained drop over a few centuries. All this contributed to this period being so cold. Then carbon dioxide started rising again around the time when the industrial revolution began. So a part of the temperature rise immediately out of the Little Ice Age is linked to the industrial revolution, and a part to the recovery from the Little Ice Age. Similarly, you can also see the sea level increasing, as we came out of the Little Ice Age. Another factor that is really important is, of course, just naturally occurring variations due to the interactions of weather variability and ocean dynamics. Disentangling how much of these past fluctuations were due to what factors is very interesting to me. HSF: Could you also predict the impact a future natural disaster will have? Hegerl: If we had a big volcanic eruption now, I think we know a lot more now than say, a decade ago, about what will happen, how this will affect climate, how this will cause short-term cooling and changes in rainfall patterns. Studying the volcanoes of the past gives us a good opportunity to figure that out. The Pinatubo eruption in 1991, for example, caused sustained cooling for a year or two, and then later, when temperatures recover, there is often a fast rise such as that seen in the later 1990s. This fast rise probably was a combination of greenhouse warming, accelerated from a rebound effect from the volcano along with natural climate fluctuations. On the other hand, you can have slowdown periods in warming due to natural fluctuations or natural forcings, such as the one we had in the early 2000s until temperatures started breaking records again in the very recent past. HSF: If you could change one thing about how governments and international organizations are handling climate change, what would be your number one agenda item? Hegerl: Oh yes, I would like them to think much more effectively about the longer-term future. Addressing climate change is so difficult, because climate changes are slower and more sustained than the period covered by an election cycle. If you do something about climate change now, you will not see any instant benefits of it during your political term. The benefits will begin in a decade or two, and be largest for our children and our grandchildren. If we do not take climate change seriously, then our children and grandchildren will really pay the price for that. I also hope that with our innovativeness, we can transition to sources of energy other than fossil fuels, and meanwhile, we can limit emissions to limit warming rates to less dangerous levels. It would be great if we could inspire more politicians to think in the longer term, and to be brave enough to address long-term problems of humanity such as climate change. HSF: What do you think that the prize funding will do for you in terms of what you can do for your own research and the things you are hoping to accomplish? Hegerl: At the moment, I have a reasonably sized research group, funded by an ERC Advanced Grant, which is going to run out in a year’s time, so it will be great to have the Hans Sigrist Prize funding to be able to continue working in many areas where I think we are just scratching the surface. When I started the ERC grant years ago, it seemed like a long time, but for example, regarding extremes of the past, there is so much more we can do. I am hoping to use this funding to work a bit more on extreme events, on understanding fluctuations in the past, and on understanding if we can trust models to simulate these fluctuations correctly. HSF: Your husband was also an academic in the area of climate change. What challenges did you face as part of a dual career couple, with you both being academics, and what do you think universities can do better to support people in your shoes? Hegerl: Dual career couples face many struggles, as it is really tricky to find satisfying positions for two people at the same or closely located academic institutions. For us, I was the junior partner in my marriage, my husband was a full professor and I was a post-doc, so I was trailing him for a while. That did have its downsides, because I was the trailing spouse who was going to be there anyway, creating little incentive for the university to provide a nice job for me. So I spent a lot of my career on project funding without a permanent position. It turns out, however, that it was not as bad as I thought at the time. I was able to pursue my research without teaching much at all initially, and eventually only a little on a voluntary basis. That helped me to combine my career with my children, but I did worry about the job insecurity. I was, of course, dependent on being able to attract funding to support my salary and my research, which I was fortunate enough to do. Looking for funding is not always easy though, and it is important that universities continue to find a way to help when both spouses have career aspirations. Sometimes, people feed off one another’s passions, and a couple can inspire one another to get further in their work. For us, it was a challenge to determine how much we would collaborate. My husband was a geologist, and he was very intuitive while I was very quantitative, so there was some difference there. I would question the way he thought about a problem, and come back with a more quantitative approach. We definitely inspired each other and learned so much from one another’s approaches. I think I am now more intuitive than some of my colleagues, due to him. HSF: As a woman in the science and mathematical fields, do you have advice for young women planning to study math and sciences? Hegerl: I think it is easy as a woman to feel that you cannot compete with the guys, who can be more vocal and sometimes more confident, and I think that is an easy trap to fall into. I have felt often, when I was younger, that half of the class was much smarter than me, because many appeared to be quick learners. I am someone who needs to think carefully, often quite slowly and ideally in a quiet room. I am then able to do things that I did not think I would be able to do, while other people were faster in their uptake and asked questions in lectures where I was just trying to follow. No matter your gender, it is important not to be too easily discouraged. I also did what I did because I found it so interesting, so I think that following your interest is also really worth doing - not just doing the strategic thing, but instead the thing that you find most interesting. It is useful to know about the studies on gender bias, on how people often listen more to men and take their suggestions up more readily – I have seen this happen, and initially, I blamed myself thinking I just didn’t phrase my suggestion right which is why it was taken up only after a guy repeated it – could be, but studies about women in committees suggest that that’s not the whole story. So my advice is to follow your interest, and do not get discouraged. It is actually quite nice raising a family while being a researcher - academic jobs can be fairly flexible, and it is nice to have the kids to distract one from agonizing about research all the time! It can be a win-win situation, even though sometimes unusual solutions are needed to deal with everyday life. HSF: Are you concerned about the recent developments in politics and the future of environmental protection? Hegerl: Yes. What worries me is that there seems to be a skepticism about science in the public, and about the value and neutrality of scientific advice to government. That really, really concerns me, because we need to make our decisions based on the best scientific understanding that people can offer. The infamous quote that came out of the Brexit discussion, “people in this country have had enough of experts”, really scares me, because ignoring scientific evidence and expert advice puts us into a bad position to make decisions. We need experts, and we rely on them when building and fixing machines, or healing disease, and we also need to listen to them when it comes to environmental problems. Society, of course, needs to make a decision not only based on what the experts say, but also based on its values and balancing multiple demands, such as protecting the planet while maintaining a viable economy. However, it is vital to start out by accepting what the experts have to say. For example, climate change is something where people who study the data, study the models, and study the physics will tell you that this is real, this is happening, and this not something you can discount as a myth. It is not a belief system, it is theory, data, modelling, observations lining up, and there is basically no wiggle room left: climate change is an important problem that will become worse the more greenhouse gases we emit, and that we can only limit if we stop emitting greenhouse gases altogether in the not too distant future. These are difficult problems to address, and starting out by ignoring or dismissing what science tells us about certain problems of our time is a terrible way to start addressing them. I can tell you that we have to take this problem seriously and if we do not, we will pay a very hefty price in the years to come.